In entirely unsurprising news for anyone that knows me, one game has dominated my limited gaming time this month. That game is Persona 5. As someone who has played, and loved, the series for some time, it's both nice and strange to see so many people getting to appreciate the weird and wonderful world of the Persona games. The previous installment of this series, Persona 4 Golden, is probably my favorite JRPG game, and this latest version manages to top that by adding a slick coat of polish and style. 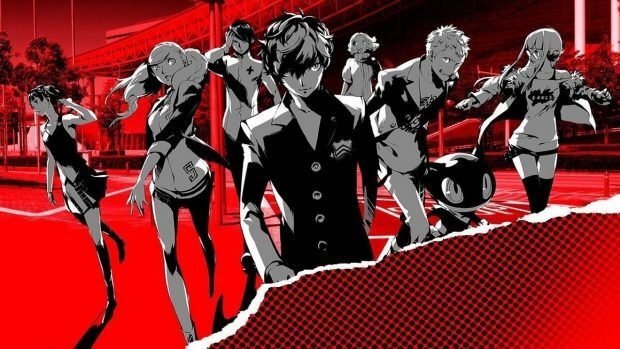 Persona 5 retains the format, character types, and interesting RPG systems of its predecessors, while ramping up the presentation significantly. This looks like no other game you have played, and is stuffed with clever and smart game design choices. If you haven't played a Persona game before the format is interesting. The game has two distinct sections. In the real world you play a Japanese schoolkid, who has to navigate all the normal pressures of teenage years. It's a time management sim of sorts. You go to school, decided what to do with your free time, when to study, when to play, when to build relationships with friends etc. The game constantly presents choices, and a limited budget. There is always more to do than you have time to do. Then of course comes the fantasy part. The series has always been about discovering the hero within, and fighting demons in an alternate reality of some kind. Your character fast becomes the leader of a gang of super powered friends, who are all able to cross over into the fantasy world (on this occasion the subconscious minds of evil adults manifest into variously themed 'castles' that need infiltrating) and right the wrongs wrought by adults upon the world. You become 'Phantom Thieves' that battle the evil shadows by using the powers of your personas. It's a surreal and weird world, with crazy enemies and dungeon crawling that settles into a pattern of trying to minimize your resource expenditure, in order to maximize your chances against the much harder bosses and sub-bosses. It's still turn based, which in all honesty, is a blessing for loyalists to the series. In these days when the RPG world has skewed towards action combat and requiring reflexes, it's refreshing to play a game content to let you consider your next move carefully. The combat in Persona 5 is tactical and revolves around status management. It is familiar and old school, while being presented with enough style that it still manages to feel modern. It is however, a long game. A very long game. The 'tutorial' lasts for a good six to eight hours, and the game only truly opens up some ten hours in. Your game clock will probably touch a hundred hours. So it's not for those with limited time. Honestly, trying to describe Persona does it an injustice. It's an experience. Something to let yourself fall into and immerse yourself in. You either get it or you don't. You'll know either way pretty quickly after starting out. Yes, it is undeniably weird, and the school setting in Japan means that it's cultural touch points don't always land, but for all that it's still an original game, some twenty plus years into the series. Personally this is amongst my favorite game series, and this latest episode is probably the best yet (at least based on the third of the game I've fought through so far!). Easy to recommend!